↑ Mussolini’s Rome - The ‘Via Dell’ Impero’ and the ‘Imperial Forums’ (1924-40): The New Studies of the Fascist Systemization of the Imperial Forums and the Unpublished Archaeological Findings (1995-2010). pp. 1-21. Martin G. Conde, Oct. 2010. ↑ “Via dell’impero. Nascita di una strada, demolizioni e scavi: 1930-1936. Scavi archeologici, sterri e demolizioni per l’apertura di via dell’Impero.” by: Umberto Broccoli, Claudio Parisi Presicce, & Maria Elisa Tittoni. Rome, July 22, 2009, pp. 3-7. ↑ Bibliography, Further Reading and [with Electronic] References, pp. 8-21. ↑ "News and Announcements | College of Agriculture and Life Sciences". Cals.cornell.edu. Retrieved 2013-08-31. ↑ Riccardo Bianchini. "Rome – The Museum of Imperial Fora". Inexhibit. Retrieved November 26, 2015. Rome, the Imperial Fora recent scholarly research and related studies (1994 - 2014). 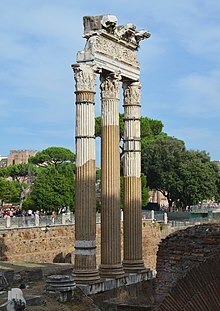 Rome, The Imperial Fora (2007 onwards) in: the "Fori Imperiali," of the: Sovrintendenza Capitolina ai Beni Culturali,' Roma (2007) [text only available in Italian. Rome, the Imperial Fora and Medieval Archaeology in Rome, 1995 onwards: Collection of 101 General News items, Scholarly Reports and Contemporary (& Historical Photographs) relating to The Crypta Balbi Museum of Rome and the Imperial Fora in the Middle Ages, by M. G. Conde (1999 onwards). Rome, the Imperial Fora, the Museum of the Imperial Fora, and the Imperial Fora Project, 2013 onwards: Collection of 173 General News items, Scholarly Reports and Contemporary (& Historical Photographs) relating to the Mayor of Rome, Ignazio Marino and the Imperial Fora Project, by M. G. Conde (2013 onwards). Rome, the Imperial Fora and the Forum of Caesar, 1998-1999 onwards: Collection of 152 General News items, Scholarly Reports and Photographs relating to the studies and excavations in the Forum of Caesar, by M. G. Conde (1999 onwards).